The return of the Farmers’ Market for me each season is just about as exciting as Christmas Day. With fresh herbs and local produce on my mind, I love getting up on Saturday morning, throwing on my yoga pants, a tank top, a pair of favorite flip flops and my over-sized sunglasses and heading out the door. Sometimes, I even pack up my 11-pound Shih Tzu, Ewok, and we ride with the radio up and the windows down on the way. This weekend was no exception. We arrived at the Statesboro Mainstreet Farmers’ Market to find pints and pints of gorgeous, red-ripened strawberries, sweet Vidalia onions, lettuce varieties, deep purple radishes and garden peas. There were homemade jams and flavored syrups, fresh cheeses, grass-fed beef, farm eggs by the dozens and wildflower honey. Stone ground grits, French bread and caramelized onion focaccia, oh my! I had to pace myself as my eyes devoured everything in sight faster than my wallet could keep up. A roadside stand on Highway 301 offers the season’s first crop of peaches from Fort Valley, Georgia. On the way home, I passed a roadside stand with the season’s first crop of Georgia peaches from Fort Valley – home of Lane Southern Orchards. I bought a basketful and can’t wait to sink my teeth into the juicy taste of sweet summertime. Vidalia Onions, Cherry Tomatoes and fresh strawberries are a few of the things I picked up from the farmers’ market. When I returned home, just in time for lunch, with all my local, seasonal fresh fruits and vegetables for the week, I whipped up this Strawberry, Chicken and Mozzarella Salad made with homemade honey mustard vinaigrette. When the strawberries are at their peak and paired with moist grilled chicken, you won’t find a more satisfying and healthy afternoon meal! Local fruits and vegetables combine for a light lunch of Strawberry, Chicken and Mozzarella Salad. The ingredients referenced in this recipe are available from Southeast Georgia farmers present every Saturday at the Statesboro Mainstreet Farmers’ Market. However, if you’re from a different area, be sure to use your own local produce! Supporting your community’s farmers and economy helps everyone in return. In a medium bowl, whisk together water, vinegar, honey mustard, honey, salt and pepper. Slowly whisk in oil to combine thoroughly; set vinaigrette aside.When ready to serve, combine greens, chicken and carrots in a large bowl; gently toss with vinaigrette, strawberries, cheese and scallions. Yields about 3 cups per serving. Food Enthusiast Rebekah Lingenfelser in the kitchen with her 10-pound Shih Tzu, Ewok. Georgia native Rebekah Faulk Lingenfelser is a freelance writer, entertainer and food enthusiast who writes and speaks about her love of good food and the Coastal South. 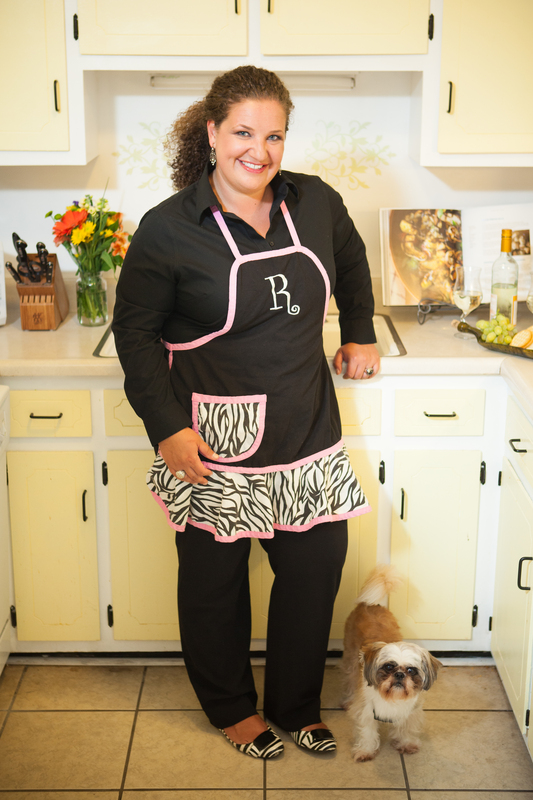 A Season 2 Contestant on ABC’s “The Taste,” she is the Statesboro Herald food columnist and host of SKG-TV on YouTube. She appears regularly as Celebrity Chef at the Statesboro Main Street Farmers’ Market and has written as a guest blogger for Visit Savannah, Savannah Taste Experience and The Local Palate. A public relations graduate of Georgia Southern University, Rebekah also attended Savannah Technical College’s Culinary Institute of Savannah. To learn more, connect with Some Kinda Good on social media, or visit https://www.rebekahlingenfelser.com/. It all looks very inviting! Yum, thanks for the recipes!